With Cupid breathing down our backs as Valentine’s Day approaches, it’s time for some to start stressing over getting a reservation for two at a trendy restaurant with an overpriced prix-fixe menu. However, if you truly want to wow that special someone, why not think outside the heart-shaped box? 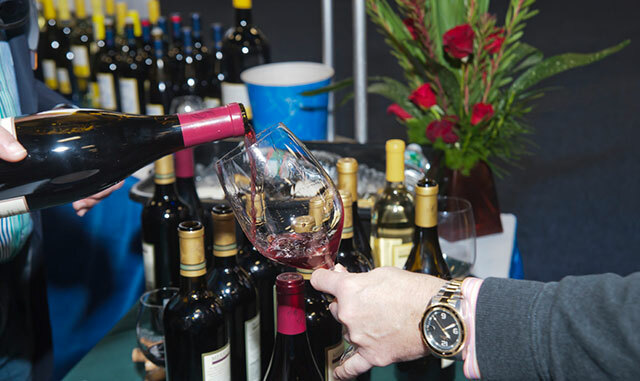 Join us at the Seaport World Trade Center for the 25th Boston Wine Expo. You can toast the show’s silver anniversary and your romance at New England’s biggest and best food and wine festival while benefitting Tufts Medical Center’s Summer Camp Program for Children With Disabilities. This year’s Grand Tasting lineup includes more than 1,800 wines from over 200 producers from around the world—and you don’t even have to bother with a pesky line at immigration. Oenophiles will be elated to find new to this year’s event the W?ne Bar. Be sure to drop by and ask members of the Boston Sommelier Society all of your wine-related questions as well as get insight into what to expect from the industry in coming years. There is also the innovative feature of purchasing your favorite bottles via the Drync app that will then deliver your purchase to your door with the press of a button. With this wine journey comes tastings from several of the area’s top restaurants. Stop by the dueling Celebrity Chef Stages to see local favorites Ming Tsai, Barbara Lynch, Chris Coombs, and many more. For the true collector in your life, be sure to get tickets to the Vintners’ Reserve Lounge Whether you’re looking for a rare vintage or a small-batch label, this is the place to be. Located in the adjacent Seaport Hotel’s Plaza Ballroom, the Lounge offers the perfect setting to sip from a selection of wines that retail for $75 and up while nibbling on special bites from the Boston area’s finest restaurants. Guests will also be able to indulge in this year’s new, special 25th Anniversary Dessert Bar, offering perfectly paired treats for that succulent swish of wine. Be sure to check back for more posts and details over the next few weeks leading up to the Expo. For ticket pricing and purchases, head to wine-expos.com!